A major function of the Community Advisory Board (CAB) is to identify and prioritize regional health issues based on the members’ combined expertise and knowledge of their respective community needs. This Health Priorities List is intended to guide grant funding opportunities offered by the Great Plains IDeA CTR Network, and inform potential applicants about research topics highlighted by CAB members. Ideally, awarded CTR projects will discover results that will positively impact the health of the community in the near future, thus improving major health concerns listed by CAB members. At the inaugural meeting in March 2017, CAB members were given a presentation of major community health issues in the Great Plains IDeA CTR Center’s region. A state-by-state analysis showed that each of the Great Plains states participating in the network have certain challenges and prominent population health issues. An initial list of priorities was drafted and the list was readdressed and refined in August 2017. 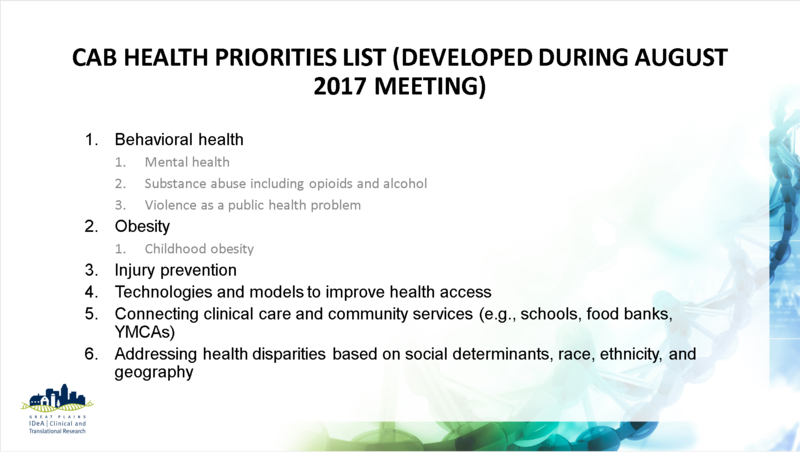 Below is the 2017 Health Priorities List of the Great Plains IDeA CTR Network.